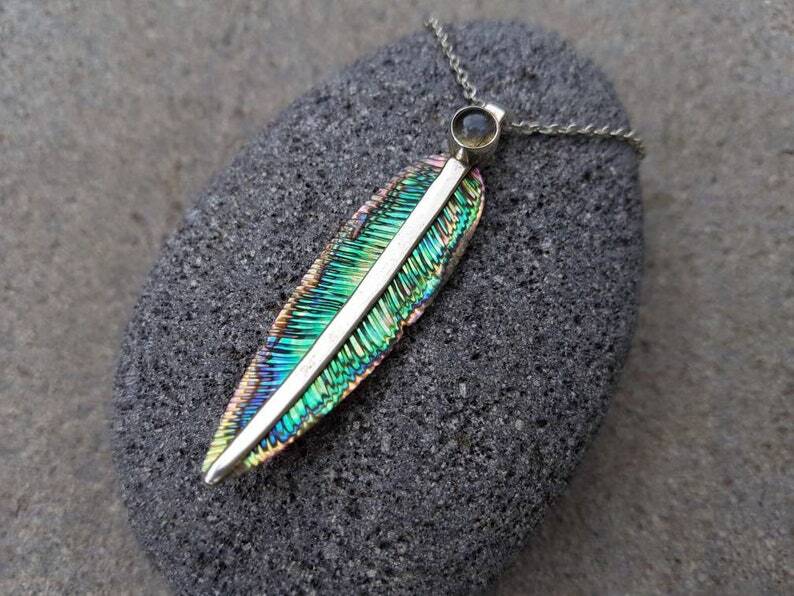 Join us in the Feather Tribe with this beautiful Blue Avian Feather Necklace, hand carved from Abalone shell with elegant Sterling Silver spine and Moonstone inlay. All natural shell, in beautiful iridescent rainbow patterns with blues and greens dominating with a varying degree of pink splashed in. It's our greatest pleasure to be connecting into the higher levels of spirituality and to be in service to planetary evolution by creating a very exciting Blue Avian feather necklace for everyone to wear and to show solidarity to full cosmic disclosure. It is our wish to share a large portion of the proceeds of this feather with Corey Goode himself so as to support his important work of getting the truth to be told. The feather is hand carved from third eye activating Abalone / Paua Shell then strengthened in a shaft of high vibrational Sterling Silver. A Moonstone inlay has been chosen for its energetic properties. Moonstone is said in crystal healing to help calm responses and stress, and avoid overreaction. It brings hope, enhances feminine energies, sensitivity, intuition, and psychic abilities. Perfect right? On an intuitive level, Abalone helps to stimulate psychic development and intuition while promoting the power of imagination. It has a soothing vibration that can help calm emotions during deep healing and will emotionally support the growth of Self. Physically, Abalone can heal the body within the Chakras but resonates most with the Third Eye, Heart and Solar Plexus Chakras. Within Third Eye Chakra, it will stimulate psychic intuition. Within the Heart Chakra it will help to gently clear and release emotions of fear, sorrow or any other negative feelings held. Within the Solar Plexus, it will use the power of Nature to re-instill the Power of Self. Mini; the feather is 2.16 inches (5.5 cms) from the tip to the top of the stem and 0.51 inches wide (1.3 cm). Together with a plated silver chain it hangs about 11 inches (28 cms) down the chest. It is hand carved from sustainably sourced abalone shell from the clear waters of Indonesia. The spine is sterling silver with a Moonstone inlay. The pendant comes with a silver plated chain as one option, and on a string of Lapis Lazuli beads "Blue spheres" as another option. For custom orders and wholesale, email us at: feathertribe1 [!at] gmail.com or just drop us a message through here. We can send you a wholesale discount code or make up a custom listing for you. We ship WORLDWIDE! Please be advised, shipping time can take between 2-4 weeks depending on where where you live. SO pretty, looks great with everything. Love this hairstick. It was worth the wait. Great customer service. Thank you so much! The feather is exquisite - wonderful proportions. The carved detail of the wood gives a handmade, authentic feel. It's finely done, while it stays true to the material, as well. I'm extremely pleased. Arrived very quickly, as postage didn't have to cover a long distance. Depending on the time of the year, we are able to do custom orders. Please enquire with us and we can give you more information. Our items are all 100% natural, and in this natural beauty they can also be very fragile. Please treat your feather with care! Love it and cherish it, and maybe take it off for strenuous work, cuddle puddles and sleeping. We do have a breakage policy though, if your feather breaks within the first month, then message us and we can send you another (you just pay for shipping), or you can have 50% off another feather. We have amazing Feather Tribe gift boxes for sale! They all feature artwork from one of our FT artists. And are available for $5 from our store. We offer a generous wholesale deal for our feather tribe family. We just ask you to buy 20 pieces to qualify for the 50% off retail prices.